Laying a floor over concrete is not a difficult process. All you need are the right materials and a solid understanding of the process. Vinyl tile is one of the easiest and most cost-effective ways to lay an attractive floor over a concrete surface. Whether you are remodeling a basement or putting a floor on new construction, you need to make sure that moisture from the ground beneath the concrete will not permeate the floor and degrade the vinyl. Clean the concrete floor thoroughly using a degreasing-type cleaner. Inspect the surface for cracks, holes and unevenness. Use concrete patch to repair any cracks or damage and self-leveling compound to create an even surface. Cut a piece of clear polyethylene sheet about 4 inches by 4 inches. Tape securely to the concrete floor. Wait 2 days to see if moisture condenses under the polyethylene. If it does, you must take steps to seal and waterproof the concrete before laying tile. Laying a moisture barrier and putting down a sub-floor may be necessary. Use a waterproof sealer on the concrete before laying tiles if moisture is not a problem. This can be purchased at your local hardware or home improvement store. Apply according to directions and allow to dry thoroughly before laying the vinyl tile. Calculate the number of vinyl tiles you will need. Vinyl tiles generally come in 12-inch by 12-inch squares, so measure how many feet wide and how many feet long the room is. Multiply these two numbers. The result will be the number of tiles you will need to cover the area. 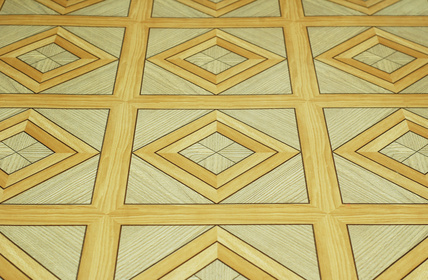 Purchase extra tiles to make up for mistakes and to repair flooring in the future, as it is unlikely you will be able to find the same color and pattern. Allow the tile and the adhesive to acclimate to your home's temperature for a couple days before laying the tile. Go to the center of the room and snap a plumb line to get a straight line to begin laying tile. Lay one row of tile without adhesive in each direction to see how much uneven space remains at the end where it touches a wall. This amount should be roughly the same on all sides of the room to get a professional look. Adjust the intersected "center" to even up the spaces on each side of the room. Spread adhesive and lay tiles in sections from the center to the outer edges, removing excess adhesive with solvent and a cloth. At the edges, overlap new tiles over one already laid to see how much to cut. Use cardboard to make templates for cutting tile to lay around irregular shapes. Allow tiles to dry for 48 hours before using the room. Allowing the tiles and adhesive to warm to room temperature will make installation easier.